[Snap] Snap fibre on the way & progress log. Forums › 2degrees › [Snap] Snap fibre on the way & progress log. 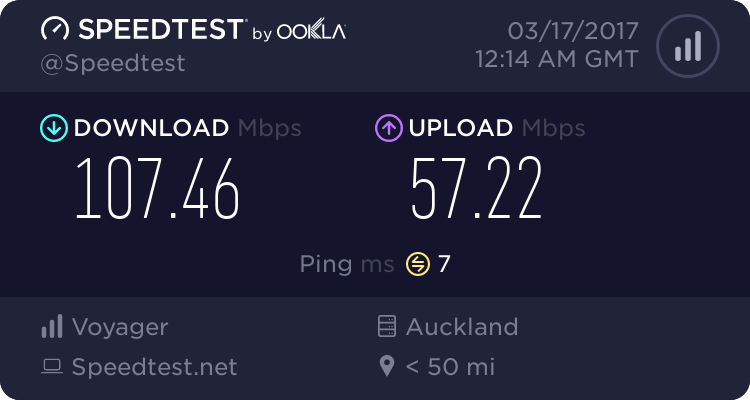 Fibre has been ready to connect at my place here in Mt Maunganui for over a year now but I've been holding off until I could connect to Snap. So, yesterday afternoon Snap said they were ready to go with my fibre installation and kicked things off. Today, had a phone call from UFF (the local equivalent to chorus) and booked a visit for tomorrow so all very timely so far. It will be interesting to see how the UFF visit goes as I'm not sure where/how they will feed the fibre into my house. The house is fairly new so hopefully it will be straight forward. OK , the boys turned up right on time and in torrential rain. First reaction was ....multilevel concrete slab house are not so easy. And, it is impossible to put the ONT into my network distribution cabinet. But, I do have a star topology network with RJ45 panels in all rooms. After scoping out the house, they decide to mount the ONT on the inside of an external wall next to a RJ45 port.Not my best option, but, is next best . These guys were thoroughly professional and took great care selecting a location to minimise visual impact both internally and externally. It is about 60 meters to run the fibre from the road to the ONT point. They needed to consult their drilling team to figure out what is possible -- after consulting, all looks good, and they will get a team to do the drilling next week. The UFF drilling guys turned up Friday afternoon (impressed, who starts new jobs then?).. They didn't have time to finish, so returned this morning and laid 60 odd meters of fibre from the road to the house connection point. I think all that is needed now is to connect the newly laid fibre into the external connection jack , and tidy it up a bit (the cable is bright red so they said they cover it up with some conduit pipe or something). 2 guys turned up on Tuesday to connect the 'red' fibre cable into the external wall socket completing the physical connection from the street to the ONT. A person turned up yesterday (Wednesday) to activate the fibre -- I guess this is the equivalent of turning on a light switch. So, next job was up to me to get it working. Disconnected DSL, and connected the ONT into fritzbox eth port 1 (this is important i think). Went into the fritzbox settings / internet/ account information , and changed line from "DSL" to "External Modem". And, you also need to set a max upstream/downstream rate otherwise it is a built in speed limiter -- why this is even there is puzzling. I guess someone has a need for it. Finally , rebooted the fritzbox, and tested. So, the process has been quick considering the amount of work required. The UFF employees were obviously well trained to do a tidy installation (unlike sky), and the drilling guys were really professional. And, snap answered the phone in less than a minute the 2 times I called them . Excellent work from UFF and Snap, thanks so much. Tauranga is now live !!!!! Great to see you enjoying your fibre - finally! I'll make sure to pass on your positive feedback to the team here as well as the guys at UFF. i hope mine goes just as easy . they are digging up the street as we speak, driving the dog nuts but they move fast, talking to them they are well ahead of schedule and i should be all go in a couple of months , big street, so i cant wait.